Part of Humanscale's award-winning Freedom seating line, the Saddle and Pony task stools are the most comfortable, versatile and ergonomic stools ever made. The original Saddle and the compact Pony Saddle make sitting comfortable and workplace movement simple while complementing any workspace or home office. The triangular cushion of the Saddle and Pony saddle encourages users to sit in a "saddle" posture. Sitting in this position lowers the thighs, opens up the hips and allows for increased circulation. The posture also reduces pressure points on the tail bone enabling long-term comfort. 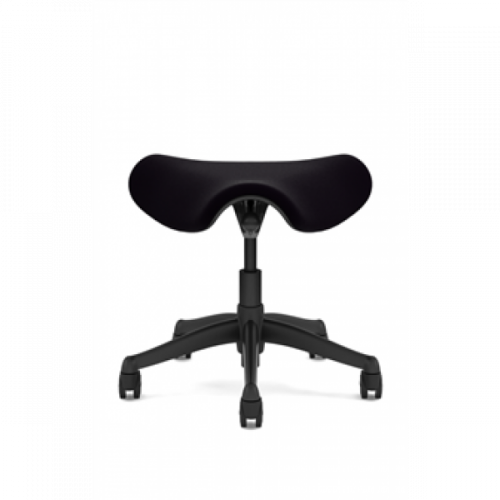 Where traditional stools are often uncomfortable, static and stiff, Freedom Saddle and Pony Saddle task stools incorporate the same ergonomic design considerations as every other Humanscale product. The result is a fun and versatile stool that encourages movement while remaining comfortable and promoting workspace wellbeing. Like all Freedom chairs, the Saddle stool and Pony Saddle stool feature adjustable height to accommodate a wide range of users and tasks. The ergonomic design of the cushion allows for multiple sitting positions and delivers ultimate comfort no matter the work environment. Able to be customized to meet a number of demanding work environments and design needs, the Saddle stool and Pony Saddle stool’s modular cushion is easily replaceable. Also available in a variety of colors and fabrics, including options ideal for healthcare and laboratory environments, the Saddle and Pony Saddle stools are a versatile solution for any space. Supported by a five year warranty on cushions and textiles, and an industry best 15 year 24/7 warranty on cylinders, casters and other mechanical add-ons. Eager to create a versatile stool that offered comfort, flexibility and encouraged correct ergonomic postures, the Saddle and Pony Saddle seats were created by the Humanscale Design Studio. Part of Humanscale’s award-winning Freedom seating line, designed by Neils Diffrient, the stools were built to meet a need for short term sitting. Unlike most modern office furniture, Humanscale's Saddle and Pony task stools are designed and engineered to last even in the most demanding of work environments. Through the use of sustainable materials, and careful study of how users interact with our high performance ergonomic tools we've created a stool that's capable of delivering comfort, while also promoting mobility and activity. Both Saddle and Pony stools are available in a wide range of finishes and fabrics.